Students collect free samples at Big Bite Night. The annual event featured 33 restaurants that handed out samples and promotional materials to students and other attendees. 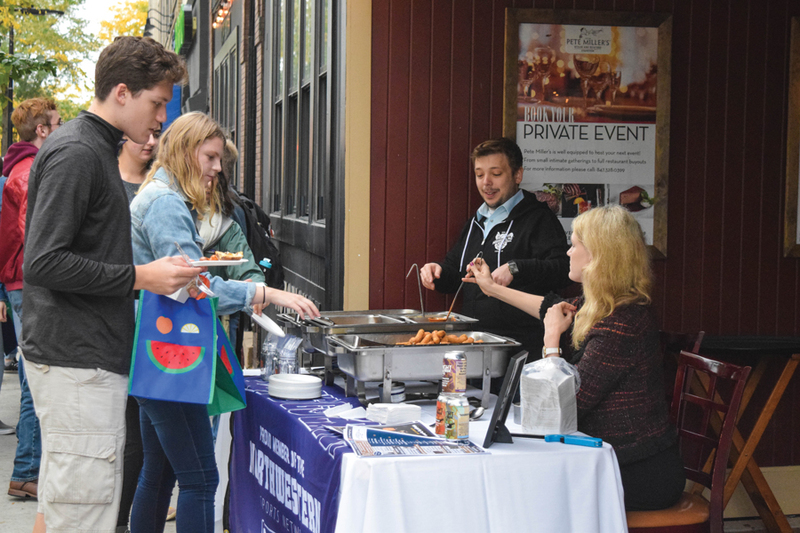 Northwestern students roamed the streets of downtown Evanston on Sunday in search of free food, as restaurants passed out samples and promotional items during Big Bite Night. Associated Student Government and Downtown Evanston co-hosted the annual event, which was held from 3 to 5 p.m, and featured 33 restaurants that opened their doors to students. SESP freshman Leah McGruder said she enjoyed walking further south in Evanston than usual and sampling restaurants she would not otherwise patronize. “It’s just a great way for Northwestern students to get exposed to the restaurants in the area, instead of just the dining halls,” McGruder said. Brian Huston, the chef and owner of Boltwood, a farm-to-table restaurant featuring American cuisine, served potato wedge samples during Big Bite Night. He said the “mom-and-pop restaurant” gets fewer students because it has a traditional feel compared to newer restaurants like Freshii, which serves a healthy fast-casual fare. Some restaurants, including Koi and Patisserie Coralie, ran out of samples toward the second half of the event. ASG vice president for community relations Meilynn Shi said this is normal because it is hard to predict the number of students that will attend the event. ASG had planned to hold an NU Votes registration booth at the check-in sites — located at Whole Foods Market and Target — but had given NU Votes too short of a notice, Shi said. Next year, Shi said ASG wants to incorporate Big Bite Night into other events occurring at the time, including voter registration efforts. Shi also hopes to work with the ASG Sustainability Committee to make Big Bite Night more environmentally friendly. “We want to make Big Bite Night more sustainable, whether that’s changing the utensils used, making the trash more sustainable or some way to encourage environmentally friendly products,” Shi said. Laura Brown, Downtown Evanston’s business development and marketing manager, said Big Bite Night aims to welcome students to Evanston. Brown added that restaurants love to open their doors to students and share samples to build up new customers.